Kansas bike riders and motorcyclists tired of endless waits at sensor-triggered red lights are about to get some relief. Gov. Sam Brownback has signed legislation allowing motorcycle and bicycle riders to proceed through a red light after waiting a reasonable amount of time for it to turn green. The new law applies to intersections where sensors in the pavement cause traffic lights to change from red to green. The sensors respond to a vehicle’s weight, and most bikes and cycles are too light to trigger them. That means riders often are stuck at what they call "dead reds" until a heavier vehicle comes along. 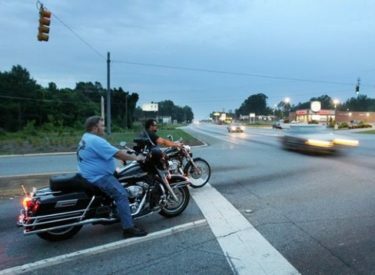 The Wichita Eagle reports that some riders are worried that the new law doesn’t define the "reasonable" time they must wait before proceeding through a dead red.